Who says chalk is temporary? 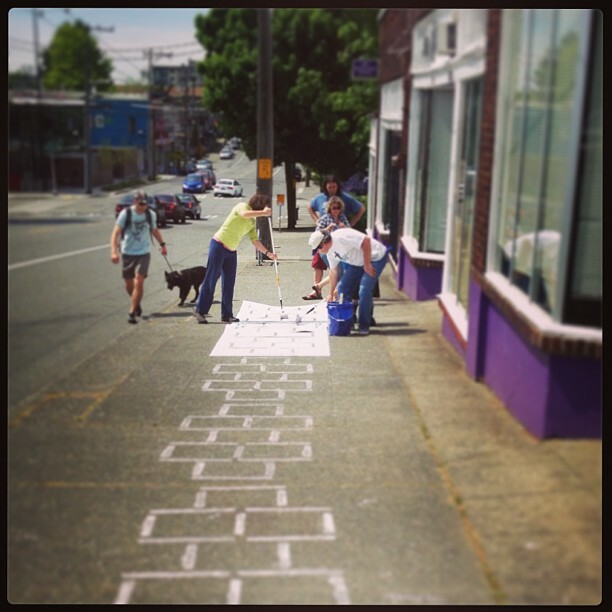 A group of changemakers in Seattle, Washington are embarking on their very own Hopscotch adventure, inspired by Hopscotch Detroit. Their 1.8 mile long course will wrap around the Central District neighborhood in Seattle. Their main goals are to have fun, meet their neighbors, and spark an idea that neighbors will want to bring back into their community in the future. The awesome people from Hopscotch CD reached out to us a few months ago looking for any learned-lessons or simple tips and tricks for the challenge they had ahead. It was incredible to hear that the idea of a super-long-crazy-fun-collaboratively-built hopscotch course was extending past Detroit, and that they have been able to expand upon the idea and change it up in ways that suits and engages their community. Hopscotch CD has been working hard and has connected with tons of sponsors and community members to prepare for the course they will be creating this week. Neighborhood captains are helping not only to build the course, but they are also hosting a part of a larger event after the course is done, on June 1st. They have done an incredible job of connecting the organizations and community members together; we really cannot wait to see and hear the stories from this upcoming week’s events. When the idea of creating the world’s longest hopscotch course originally floated around Detroit, it was difficult for people to visualize the possibilities, and even more difficult to understand the potential for impact. Even after the lines were washed away and the excitement had died down, we wondered what the everlasting impact would be. Knowing that Hopscotch CD exists tells us that there is potential for so many more hopscotches in the world, and many more opportunities for similar projects. For those of you who have ever thought about creating such a project in your communities, please feel free to reach out to us. We will happily share materials, insight, and support to help make your event a successful one. Maybe the chalk was temporary, but the impact is not, and that impact will continue to grow with the stretch of the course.